Home > Latest News > Vishal’s hand-cuffed picture which went viral is a still from his film! Vishal’s hand-cuffed picture which went viral is a still from his film! Actor Vishal seems to be in the news for one reason or the other. Almost everyday, there is a report on the actor. If it is about his film projects on some days, it is about his activities involving the Nadigar Sangam and the Tamil Film Producers Council on others. Recently, media houses had put out reports stating that the actor was to tie the knot in August this year. One media house jumped the gun and put out pictures of a person they said the actor was to wed later this year. The actor had to then issue a clarification saying that the person in the picture was not the person he was to wed. 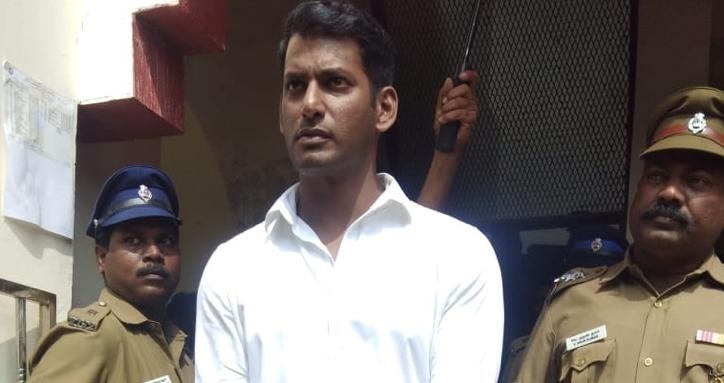 Under these circumstances, a picture showing Vishal in handcuffs began doing the rounds on social media. Many began wondering if the actor had been arrested. The topic went viral until the actor had to step in to make another clarification. The actor’s team clarified that the photo was nothing but a click from the shooting spot of his upcoming film Ayogya. The film is directed by Venkat Mohan, a former associate of filmmaker AR Murugadoss. Raashi Khanna is playing the female lead in this film, which has an ensemble star-cast including Parthiepan, KS Ravikumar, Sachu, Vamsi and many more familiar actors. While Sam CS is composing music for this film, VI Karthik is handling its cinematography. Ruben is the editor. SS Murthi (Art), Ram-Laxman (Stunts), Brindha-Shobi (Choreography), Uthara Menon (Costumes), Yugabharathi-Vivek (Lyrics), Vakkantham Vamsi (Base Story) are the others in the technical team. Ayogya is produced by B Madhu for Light House Movie Makers and the shooting is proceeding at a brisk pace. Tagged Vishal’s hand-cuffed picture which went viral is a still from his film! Cricketer Dinesh Karthik is the latest to shower praise on director Kathik Subbaraj for his film, Petta.